A scheme to connect LPC students with City Law School alumni has hosted its first meet up event at Gray's Inn. City Law School has set up a mentor scheme to match LPC students with current legal practitioners. The majority of the professionals have been sourced from CLS alumni, with others coming from respected firms across London. Each of them has agreed to act as a mentor to one or more LPC students. They will provide informal advice and guidance, as well a window into the realities of their work. Linda Jotham is the Deputy Programme Director of the LPC and a Senior Lecturer in Law. She says support from a current legal practitioner is invaluable to an LPC student at the start of their career. "The initial meetings in the CLS LPC mentoring scheme have been a great success. Students tell us they appreciate the care with which their individual mentor has been selected and many are already benefiting from their advice and support." Jo Joyce completed the LPC at City Law School in 2009 and subsequently secured a training contract with Shoosmiths. She says she is delighted to be able to return as a mentor. "I particularly enjoyed the small collegiate environment of the City LPC. The tutors know you by name and continue to take an interest as your career progresses. What really sets City apart is the high quality of tuition - the lecturers are experts in their field but they are also excellent educators." 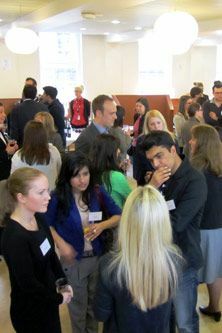 The initial introduction event was held on Tuesday 24 April at Gray's Inn. The mentors and their respective students will arrange to talk on at least three occasions during the academic year.